What Must Be Done To Get Social Security Disability! You’ve applied for social security disability benefits. Do you want to know what you have to do, what you have to show in order to win? I’m Sam Gaylord, disability attorney in the state of New Jersey handling matters in the areas of worker’s compensation, social security disability, and disability pension appeals. 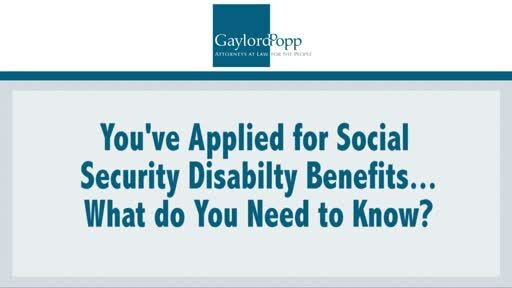 You’ve applied for social security disability, and you want to know what it’s going to take in order to get your benefits. The answer is quite a lot. What we have to do – the first thing that we always look to do – is get specific statements from yourself about the problems you’re experiencing. We also get family members or other co-employees that have worked with you historically to provide statements about how this disability has affected you and how it prevents you from working. In addition to that, we also put together descriptions of your prior jobs and what you used to do while working. We need to get that information for social security fifteen years prior to the time you’re applying for your social security disability benefits. In addition to those pieces of information, we have to acquire medical documentation. This is the most important, critical piece of your claim. The more medical proof, the more medical documentation, the easier it’s going to be to acquire your social security disability benefits. If necessary, we will also contact your doctor and acquire an opinion as to what your disability is and how it prevents you from going back to work. It’s important especially if your disability is unique and not common. That information is important to give to a judge who may not understand your disability. With all of this information, you may have additional questions as to how you can win your social security disability case. And if you do, I encourage you to pick up the phone and give me a call at 609-246-0668 or send me an email at sgaylord@gaylordpopp.com.